One of the things I knew from the beginning I wanted to add to my Command Center is a jobs-for-hire board. 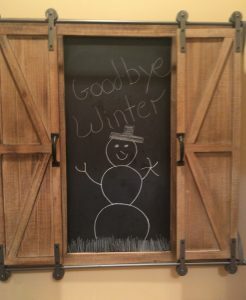 When I received this beautiful barn door chalk/magnet/ cork board for Christmas, I knew I had found the home for my jobs-for-hire board. The jobs I list on my Jobs-For-Hire board are usually quick jobs I could use some help with. I list things like “Vacuum the stairs” or “Unload the dishwasher”. Along with the jobs, I include how much you will be paid for the job and I attach the cash to the cork board behind the job posting. This simple practice allows the kids to get paid immediately – instead of possibly having to wait for me to get the correct change. 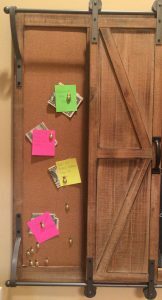 The beautiful barn door organizer I received for Christmas has a cork board behind the left door and a magnet board behind the right. The doors can be left in multiple positions. I used the cork board side or my organizer for my jobs-for-hire board. 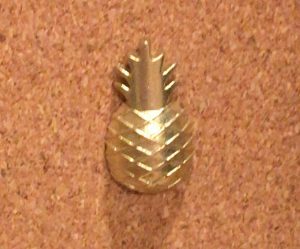 I use neon index cars on which to list the jobs, and I found these adorable little pineapple push pins to attach the cards. When I created my jobs-for-hire board, I pre-made several job cards. 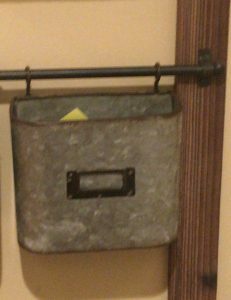 I keep the extra cards, and some extra dollar bills, in this cute little bin which is attached to the mail sorter I have in our command center. Homework must be complete before you can work on any of the jobs-for-hire available jobs. If you take a job, you must begin working on it right away. No one is allowed to take a job down and save it for later. Unless there are two jobs listed that can be worked on simultaneously, you are only allowed to take one job at a time. You may not choose a job from the storage bin. Only the jobs posted on the board are currently available. You can ask for help getting started or finishing up, but you cannot select a job where you will need help the entire time you are working on the job. This rule was included because here are some jobs in my house where one kid would be able to complete the job alone, but the other kid would need quite a bit of help. If you choose a job that involves mopping, you have to use the steam mop, you cannot just turn on the iRobot mop and leave. If you choose a job that involves vacuuming, you cannot simply turn on the Roomba and leave, you have to use the manual vacuum. Some of the rules might seem obvious, for example if I wanted to run one of the iRobots I would have just done that instead of taking the time to post a job, but kids are smart so I figured I had better add that in or I would be paying them to simply hit the start button. So far, so good. Some days the kids will work on all of the jobs as soon as they finish their homework. Some days they do not do any of the jobs at all. This is exactly what I was hoping for. As opposed to their allowance, or the money they are given for good grades, they can use the jobs-for-hire board whenever they want or need a few extra dollars. And if they have no immediate desire for extra cash, they are not required to work on any of the jobs. I consider this project a success.